Chris Crow’s ground-breaking, hard-edged psycho-cyber horror thriller PANIC BUTTON gets a remastered launch on DVD & Download from October 23, 2017 and to celebrate with have 2 copies to give away. 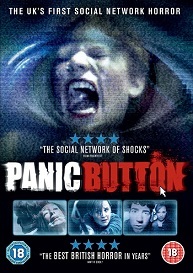 Panic Button, made in 2011, was one of the first British horror films to explore the dark side of social networking and the perils of sharing too much information online. Played out in a claustrophobic, almost real-time situation, the film taps into pertinent social issues that now have a universal significance in the digital age. Themes such as social media crime, identity theft, cyber bullying, voyeurism, peer pressure, child safety and terrorism all come into play, at a time when iPads and smart phone apps were only in there early generations. You can buy this from HMV UK using the following link that opens in a new window.